I wrote a pretty harsh post a year ago regarding the Season 6 ending of The Walking Dead. Leaving us with the knowledge that someone just DIED but not knowing who, all summer, for six long terrible excruciating months… Yeah, I was pretty upset. So, I thought it was only fitting a year later to say thank you to Scott Gimple, Greg Nicotero and the rest of TWD crew for The Walking Dead Season 7 Finale. Instead of leaving the fandom twisted up in knots, we were instead served up a dramatic, action packed episode that ended with Maggie giving one of the most memorable speeches in TWD history. We left Season 7 with a soft fade out where everyone is safe, for the time being, instead of bloody barbed wire bats in mid swing. I know it’s just a show, I KNOW it is, but when King Ezekiel yelled “Alexandria will not fall!” I got goosebumps. I swear, if I lived in The Walking Dead Universe (and had actually survived past Season 1) I would put on some athletic store padding as armor and follow King Ezekiel anywhere after that scene. One thing that nibbled on my brain, pardon the pun, was the exchange between Jadis and Negan when she says “The deal was for 12, yes?” and he says “10. People are a resource.” I suddenly got a weird Terminus flashback. I mean, why did they take Father Gabriel along with the food? Why did Jadis double cross Rick with a “better deal” for people from Negan? Are the Scavengers secret cannibals? 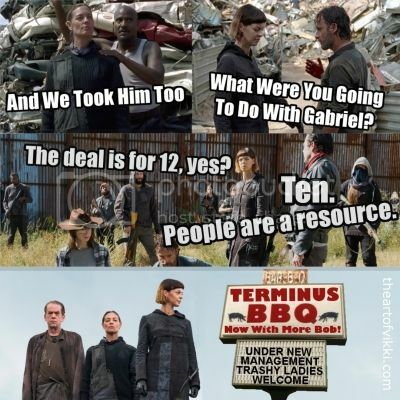 I did a little Terminus BBQ meme and posted it to my Instagram to see if I was the only one getting this weird cannibal vibe. Sabrina Gennarino, who plays Tamiel, got a giggle out of it and shared it with her followers. Between our two accounts my Scavengers As Cannibals meme got quite a few likes so maybe I’m on to something. Which is horrifying! So, anyway… thanks again The Walking Dead people for making the Season 7 finale less of a cliffhanger than last year. Waiting 6 months for Season 8 to start is still difficult, but at least this summer will not be filled with as much angst as last year. Thank goodness. 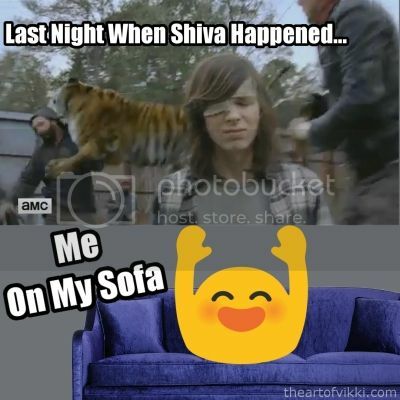 This entry was posted in Geek and tagged are the scavengers cannibals, cannibals, father Gabriel, king Ezekiel, Sabrina Gennarino, season 7, season 7 episode 16, shiva, tamiel, terminus, the scavengers, the walking dead, the walking dead memes, twd, twdfamily, walkers, zombies by The Art Of Vikki. Bookmark the permalink.